Today, we need to keep the environment in mind in most everything we do and that includes remodeling and building especially in the kitchen which is the room in the home that gets the most use. If you are either building a house that needs a kitchen design, or you are in the midst of a kitchen remodeling project, trying to be eco-friendly should be part of your plans. 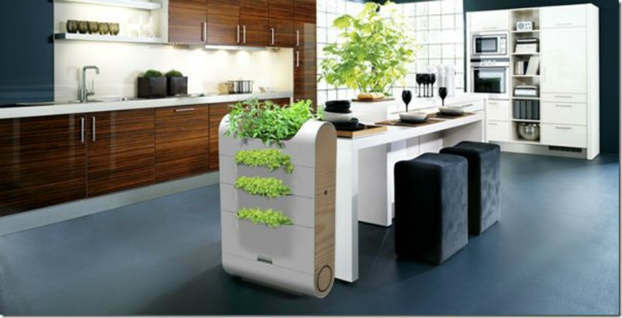 Green Kitchen: Tips For Going Green In The Kitchen (Green Living). When it comes to green kitchen tips, your choosing an eco friendly kitchen flooring can go a long way towards being green. Consider using a cork, bamboo or some other type of natural or recycled flooring product. There are a number of options out there, and most are very durable. The most readily available recycled flooring is a rubber flooring. These are made of 80 - 100% post consumer product including tires. Rubber floors are extremely durable and come in a variety of colors and styles. Cork and bamboo, while not recycled, both offer quickly renewable products that don't require deforestation of millions of trees to produce these types of floors. Both cork and bamboo are natural products as well. If you prefer an older, more traditional or even antique look, you might want to consider reclaimed wood flooring which will give you a traditional look in your eco friendly kitchen. This is exactly what it sounds like; used wood that has been removed from another house or building, then reconditioned and made ready to install in your home. For the rich warmth of aged wood, this product can provide the look without destroying more trees. When it comes to going green in the kitchen, you should choose your lighting carefully. When you choose the lighting for your new or remodeled kitchen, you can use products that will keep to the green theme. First, look to the types of bulbs you will use. Fixtures that have CFL bulbs rather than incandescent bulbs use one quarter of the power. LED lights can reduce energy consumption by 80-90%. Lamps and fixtures that use LED lights are usually built exclusively for that type of bulb. CFL bulbs can be used in any fixture that accepts a regular incandescent bulb. In addition to artificial lights, also consider the use of skylights and sufficient amounts of energy efficient windows in your plan. By making natural light readily available in your kitchen, you can significantly reduce the need for artificial light sources, at least during the day. You may also want to consider solar powered options for lighting. One of my favorite green kitchen tips is recycled glass counter tops which are quickly becoming a popular product for use in kitchens. These glass counter tops are very durable, and have a variety of styles that actually mimic the look of granite and marble. They are a mixture of recycled glass with a concrete base, or resins that are non-petroleum based that can be used for safe and beautiful eco-friendly kitchen countertops. One of the most talked about ways of going green in the kitchen is to by energy efficient appliances. When you are ready to outfit your kitchen with new appliances, be sure to look for appliances that are marked with the energy saver labeling. All large appliances are now energy rated, so you will be able to comparison shop for the most efficient ones out there. While many people think that solar energy only comes in the form of a whole-house system that includes panels that cover the roof of your home, there are other options that can provide solar power for efficient applications that are much less complicated. Rather than taking on the large scale solar conversion for all your electric needs, you could consider a small solar system that runs your water heater to take care of all your hot water needs which can help add to your eco friendly kitchen design. These systems are compact, and designed to work exclusively on your electric hot water heater system. This type of system costs only a fraction of what a whole-house solar system costs, and can save you hundreds of dollars per year off your electric bill. This goes for shopping as well as kitchen clean-up. When you do your grocery shopping, opt for fabric, reusable bags to carry home your purchases. This keeps literally tons of plastic and paper out of the landfills each year. Another fabric to opt for is in the towels you use. Opt for cloth towels for your kitchen clean-ups rather than paper. Not only will you be keeping all that extra paper out of the landfill, but you'll save a bunch of money not spent on paper towels so this is one of those green kitchen tips that can save you money too. Start composting your kitchen scraps. You can create rich organic soil from the materials you compost. Simply put, composting is a process that allows you to place food, coffee grounds and other kitchen scraps in a pile created outside. The materials added go through a natural rotting process that eventually turns them into a product that can be added to soil in your garden to provide nutrients. Composing is relatively easy and another way to keep unnecessary waste out of the trash. There are more and more green cleaning products available to use in your home. These environmentally friendly products don't use harsh chemicals to do the cleaning. They are derived from natural and safe materials that do a great job cleaning things without putting anything dangerous into waste water. You can also come up with some of your own green products with things around the home, like vinegar to clean windows or baking soda to get stains off dishes. Going green in the kitchen can be tasty too and a delicious way to keep up with your eco-friendly kitchen is to try to buy as much organic or local produce as possible. Organic produce is popular because the farming process used to grow organically doesn't deplete the land and doesn't introduce any chemicals into the soil or plants. Whether organic or not, using local produce is a great idea as well because it supports local business and you know where the product is being grown. Best of all, it doesn't get shipped across the country in a truck, and it is usually picked fresh at the peak of it's ripeness, so it just tastes better. Whether your redoing your kitchen or just trying to do things better, you can make many changes that will lead to a more eco-friendly kitchen in your home. It just takes a bit of attention to doing the right things, and it will eventually become your way of life. Get some more green kitchen tips [http://greenologyspot.com/green-kitchen-tips-that-dont-cost-money] and find other ways of going green at [http://greenologyspot.com].